Solar Co-ops Archives - Solar Love! The US Energy Department this week unveiled a new version of its PV System Toolkit — a complete package of development tools designed to make it easier for cooperative utility companies in rural areas to transition to renewable solar power. “This resource is a ready-to-use set of standard engineering designs, financing models, templates, tools, and plans, and its suite of materials offers best practices designed to reduce solar adoption costs and help co-ops across the country navigate the many ways in which they can integrate solar into their asset portfolios,” according to the National Rural Electric Cooperative Association. America’s 800 rural electric co-ops provide power to only 12% of all Americans, but those people occupy 70% of the total area of the United States. Because they are non-profit organizations, they are not eligible for the sizable federal solar power incentives available to for profit companies like Duke Energy, Xcel Energy and the other large energy companies who serve urban and suburban America. That makes lowering the costs of installing solar power by rural co-ops essential to the spread of renewable power resources to all people. The PV System Toolkit is supported by the Energy Department’s SunShot solar initiative. It is interesting that the new head of the department, Rick Perry, is a Trump appointee but is also an advocate of renewable energy. As governor of Texas, Perry was also a strong advocate for renewables, especially the wind energy resources that are rapidly becoming the mainstay of new power generation in the Lone Star state. “NRECA is engaging hundreds of co-ops and thousands of co-op staffers and representatives as they consider offering solar power as an option for their members. From 2015 to 2016, 3,000 representatives from 347 co-ops — more than a third of all co-ops and more than half of all generation transmission co-ops — participated in NRECA’s PV System Toolkit webinars.” Thousands of co-op board members and employees are also engaging with the PV System Toolkit and solar training sessions for co-ops. 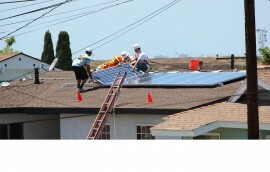 In this week’s announcement, the Energy Department said, “America’s electric cooperatives expect to double their current solar capacity by the end of 2017, adding more than 480 megawatts of solar for a total capacity of 873 MW nationwide.” So far, NRECA has provided support for utility scale solar projects to communities in 15 states. In all, a total of 23 megawatts of solar energy have been installed as a result of its efforts. Originally published on Green Living Ideas. Before I begin writing about energy gardens, it is incredibly helpful to understand what they are, what they aren’t, and their level of independence from whatever energy utility serves the vicinity. According to the US Department of Energy, “distributed energy consists of a range of smaller-scale and modular devices designed to provide electricity, and sometimes also thermal energy, in locations close to consumers.” A solar garden fits in this category. They include, adds the DOE, fossil and renewable energy technologies (e.g., photovoltaic arrays, wind turbines, microturbines, reciprocating engines, fuel cells, combustion turbines, and steam turbines); energy storage devices (e.g., batteries and flywheels); and combined heat and power systems. In other words, there are a lot of options when we talk of distributed energy. A new analysis from the National Renewable Energy Laboratory (NREL) predicts “solar gardens” could account for one-third to one-half of all solar PV power in the United States by 2020. Wow! This is especially relevant to families unable to install their own solar, either because of budget or location, who want a part in the green energy revolution. The Colorado Legislature passed the Community Solar Gardens Act (CSGA) in 2010 with the intended purpose of spurring the development of community solar gardens (CSGs) in the territories of investor-owned utilities. In Colorado, the dominant utility is Xcel Energy. The CSGA defines a CSG as a solar electric generation facility with a nameplate rating of two megawatts or less, and have at least 10 subscribers. In Massachusetts community Solarize campaigns began, the most active one at Harvard. The Solarize Program simplified the work while providing the advantage of a “bulk buy” to reduce system costs. Steven Strong of Solar Design Associates provided technical guidance pro bono to this first shareholder-owned solar garden. The state provided a grant of over $150,000 for the launch. Then there is the utility side of this distributed energy concept. In Michigan, electric customers of Consumers Energy are eligible to subscribe to the planned solar garden programs. The program offers a 25-year subscription plan with flexible payment options available. Xcel Energy offers community solar options in Colorado and Minnesota. The idea of independent energy may seem compromised, however, because this is an enormous utility company. It does bring key assets to the table, though, such as an electricity distribution infrastrcture. According to Greentech Media, GTM Research identifies community solar as the next largest solar growth market in the United States. Over the next two years, community solar in the U.S. is poised to see its market share increase sevenfold, and by 2020 GTM Research expects US community solar to be a half-gigawatt annual market. Green living enthusiasts can share high-fives! Power for All is a global campaign dedicated to promoting the fastest, most cost-effective, and most sustainable approach to universal energy access. It was first introduced at the United Nation’s Sustainable Energy For All forum in New York on May 21, 2015, reports TreeHugger. The Power For All vision is bold. It claims that access to distributed, democratized, and renewable energy is not just feasible, but can be delivered twice as fast and at 10% of the cost of the top-down, centralized model that has dominated the electrical energy industry since George Westinghouse first invented the centralized grid system. It especially focuses on rural communities in much of Africa and parts of Asia that are too remote to ever be served by a traditional grid distribution system. For die-hard capitalists who are committed to profits ahead of sustainable living, Power For All says its vision can be achieved using market-based approaches. Doing so will allow the world’s 1.2 billion citizens who currently lack access to reliable electricity to invest in, influence, and have ownership of their own energy future. Let’s think about that for a moment. Power is more than just another name for electricity. It represents the ability of people to control their own lives, determine their own destinies, and make their own contributions to the global community. Who knows how many Elon Musks or Thomas Edisons or Nikola Teslas are out there in the underdeveloped world, just waiting to be empowered by electricity so they can make a contribution to the world community? Access to abundant, affordable electrical energy is about more than driving an expensive battery-powered electric car. It is about lifting people out of poverty and making them productive, healthy, valued members of society. 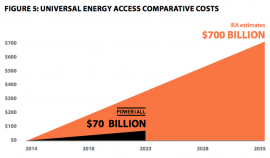 The International Energy Agency says universal energy could be achieved by 2035 at a cost of $700 billion. 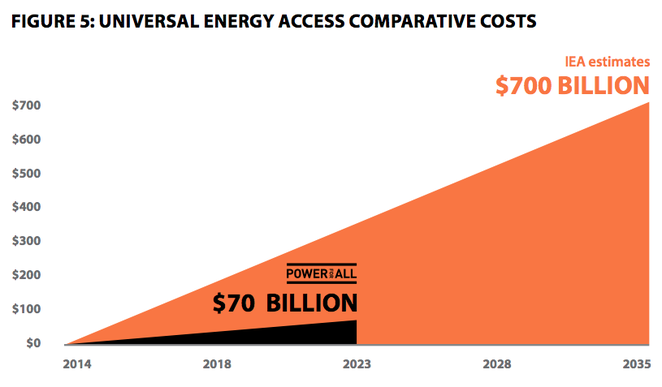 Power For All says it can be done by 2025 at a cost of only $70 billion. The group wants to make its plan a central focus of the next world conference on climate change in Paris this December. With a promise like that, why would anyone want to wait? That’s an excellent question. The answer is that “power” is also a term that implies control over others. In today’s world, hundreds of enormous corporations have power over the global marketplace and they will strongly resist any initiative that threatens to reduce that power or the profits that flow to them as a result of it. Among its activities, Power for All will urge world leaders to institute policies that support renewable, decentralized solutions. It will also encourage governments, NGOs, investors and banks to mobilize capital specifically for decentralized, renewable solutions. Part of the Power For All mission is to promote the idea of grants that encourage sustainable, market-based initiatives leading to decentralized energy solutions for universal energy access. The Power For All initiative has echoes of the “power to the people” movement in America in the 1960s. That sentiment got co-opted by the very market forces Power For All seeks to harness. Will the result be different this time? A group of Baltimore residents have banded together to form a solar energy co-op. The idea for the co-operative began with Retrofit Baltimore, a part of the nonprofit Civic Works that helps residents make their homes more energy efficient. Co-op members expect to save about 25% on their electric bills every month. The main benefits of a co-op are that it allows multiple home owners negotiate the best possible price for system installations with a single contractor. It also simplifies and de-mystifies the rooftop solar process for residents who are interested in home solar but don’t know where to begin. About 25 other co-ops have been launched in the past two years across Maryland, Virginia, Washington and West Virginia, according to Corey Ramsden, the Maryland program director for the Community Power Network, a network of groups promoting renewable energy. According to the Baltimore Sun, several green organizations and churches launched the Baltimore Interfaith Solar Co-op last year, drawing 90 residents from all across the metro area. That co-op is believed to be the first of its kind in the Baltimore area. About 25 other co-ops have been launched in the past two years across Maryland, Virginia, Washington and West Virginia, according to Ramsden. Eli Allen, the director of Retrofit Baltimore, said the co-op has attracted about 65 members so far. Residents are welcome to join the co-op up until Earth Day on April 22. Members can save about 25%, driving the cost of a 3 kilowatt system, which is appropriate for a typical Baltimore row house, down to about $4,000 after various state and federal incentives. One member of the co-op, Avis Ransom, says the co-op gave her additional motivation because of the cost savings from buying as a group. She also says there is another advantage of rooftop solar that most never even consider. She points out that using less energy at home has a multiplier effect because of the energy losses involved in transmitting power across great distances. “Energy efficiency is in effect a source of energy,” she says.